Mission Impossible. Number 4. Brad Bird. Burj Khalifa. IMAX. 95%. Wow. Well, folks, that just about wraps up this movie review in a series of keywords. Fun? Thrill ride? Great entertainment for all you adrenaline junkies? Check, check, and double check. This is it; this is the action film of the year. Okay, you're going to point out I haven't mentioned Tom Cruise and yeah, he's in it and he does his stuff but the real stars? Hats off to Industrial Light & Magic, the Burj Khalifa and some fabulous cinematography which includes, by the way, the mother of all movie cameras, IMAX. And, let's not forget story and screenplay by André Nemec and Josh Appelbaum along with the debut of Brad Bird directing live-action. Brad Bird is currently riding the success wave having done the films The Incredibles and Ratatouille and is apparently quite sought after in Hollywood. With this under his belt, his "soughtness" is going to go through the roof. It's at this point in a movie review, the author tells you about the plot. Do you really care? If you've seen the trailer, you already known the premise of the story: terrorist bombing at the Kremlin, IMF gets blamed; the team has to go undercover with no official support in order to find out who the real perpetrator is. That's all you need to know because from there it's just nonstop go, go, go. How many novel ways can screenwriters come up with to have fights which dazzle our imaginations? The fight scene in the automated parking garage where platforms raise and lower cars is one of those I've-never-seen-that- before moments. It's a theme of the MI movies than our hero climb things and here we have him scaling the world's tallest skyscraper (for now). Okay it's a stunt but wow nevertheless. It's interesting to note the jump in the film's rating on Rotten Tomatoes for number three in the franchise. Was the addition of Philip Seymour Hoffman as the bad guy that much of a plus to change the quality of the entire film in the eyes of the critics? I also note that J. J. Abrams was involved in the creation of the story for number three and directed the film, his first involvement in the series. I loved the thrill rush of the tower climbing being as much of an adrenaline junkie as the next guy... or gal. I do, however, have to chuckle about the hype surrounding Tom doing his own stunts at the top of the tower, the Burj Khalifa, in Dubai. I trust everybody realizes that there is no way the film company would let him go out there if it wasn't safe. Yes, let's kill off our star in the middle of production. I'm mentioning this because I did a tandem parachute jump some time back (Parachuting: If God had meant me to...) and while anybody might say, "Oooo" at what appears to be dangerous, I was amused to discover in writing about my experience that statistically, I was safer parachuting than driving my car. Yep, I stand a better chance of getting creamed in a car then going splat jumping out of a plane. As such, I'm sure that what Tom was doing was more than just safe. After all, now the CN Tower in Toronto, Canada is offering something called EdgeWalk. It is the world's highest full-circle, hands-free walk at a height of 346 metres or 1,135 ft. Visitors are tethered to an overhead rail system and walk around the edge of the CN Tower's main pod above the 360 Restaurant on a 1.8-metre (5.9 ft) metal floor. So, thrilled by Tom climbing around Burj Khalifa? Come to Toronto and you can do sort of the same thing. 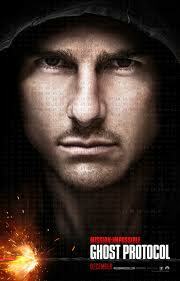 Yes, you too can not only see Ghost Protocol, you can do part of it yourself. ... Come on, I dare ya. Chicken! Do not, I repeat, do not go see this in a regular theatre. This is supposed to be a blow your socks off Holy C**p entertainment experience so why tone down the eye-popping, ear-splitting fun when you can just as easily pump up the volume with a five story screen and a 12,000 watts sound system? So what if it's an extra five bucks or whatever. It is going to be worth it. From my reading only certain parts of the film were shot using the IMAX system but I had no idea what those parts were. I could guess the tower shots in Dubai but I don't know. Whatever the case, I found the entire film to be crystal clear with a certain richness of colour which had me on several occasions going Wow. The aerial cinematography in Dubai was truly breath-taking and had me thinking that I have to go there once in my life and see it for real. Of course, am I going to be able to afford a hotel room? Do they rent by the hour? It's probably all I can afford. I'm sure everybody has seen the trailer by now and heard the song Won't Back Down by Eminem featuring Pink. It works great in the trailer for the montage of action clips however the song is not used in the movie at all. Just a curiosity I noted while watching the film. If you love Tom Cruise, go see this film. If you like your adrenaline served up intravenously, go see this film. If you want to get yourself worked up by some nonstop action with fights, car chases, explosions and of course, some human fly climbing a tower, go see this film. You are not going to be disappointed. Kudos to everyone involved, they have managed to put together an excellent piece of entertainment. I highly recommend it and for one last time - I won't back down! - See it in IMAX!!! Stylish, fast-paced, and loaded with gripping set pieces, the fourth Mission: Impossible is big-budget popcorn entertainment that really works. Mission: Impossible – Ghost Protocol is a 2011 action spy film, and the fourth installment in the Mission: Impossible series. It stars Tom Cruise, who reprises his role of IMF Agent Ethan Hunt, and is director Brad Bird's first live-action film. Ghost Protocol was written by André Nemec and Josh Appelbaum, and produced by Cruise, J. J. Abrams (director of the third film) and Bryan Burk. It is the first Mission: Impossible film not produced by Paula Wagner, and the first of the series to be partially filmed using IMAX cameras. The film was released in North America on December 16, 2011, to positive reviews.